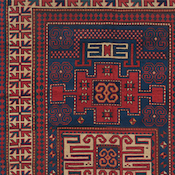 Karachov Kazak: A quite famous and seldom-found design type, usually attributed to the Armenian weavers of the high Caucasus Mountains. The best of the Karachov rugs (also spelled Karachoph) are stunning beautiful 19th-century antique Oriental rugs, which are the most difficult to locate and quite cherished by collectors of antique rugs. 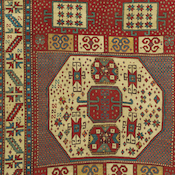 The most notable 19th-century Karachov Kazak rug designs include an octagonal or elongated rectangular medallion flanked by elemental cruciform motifs, containing the “Star of Wisdom” and “Ram’s Horn” motifs. 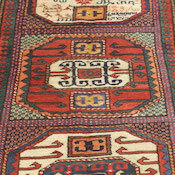 Both the central medallions and all of the designs place in the best 19th-century antique Caucasian rugs are woven intentionally misshapen and playfully asymmetrical. 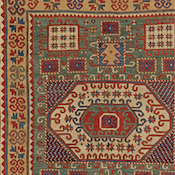 Like the motifs of the field, the borders of the rugs are usually sparsely decorated with ruggedly geometric motifs, sometimes elemental arrows or stars. The finest Karachov antique rugs are famous for their excellent, luminous wool and deep, glowing blues and, occasionally, greens. The warps of these antique Caucasian tribal rugs are usually undyed gray yarn, wefts are triple spun, and the selvages are rusty-brown and single-wrapped. 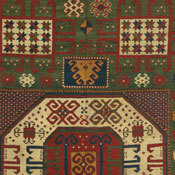 The Caucasian Kazak rug to the right is a virtuoso, quite early example of the prized Karachoph subgroup. This highly collectible antique rug carries both tour-de-force artistry and excellent condition at over 1½ centuries of age with heavy, lustrous pile. A whimsical array of improvisationally rendered secondary motifs comprise the supporting cast to the enigmatic cruciform mandala and twin boxed reserves in the field. The color range in this high mountain antique tribal rug’s is entrancing, highlighted by an expanse of prized green shifting to dark forest to jade to spruce tones via expertly conceived abrash. 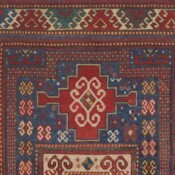 The designs of its borders are extremely unique for the Karachov style of high mountain Kazak rug, particularly the starflower inner border set against a rich saffron base and the repeating dragon main border, and serve to further enhance the rarity of this antique Caucasian rug.